We often talk about the richest people in the world or the most powerful or influential people in the world, what has not yet been given much attention to is who are the most charitable, cheerful givers in the world. It is known worldwide that most of the most prominent figures and celebrities are all involved in one charity or the other stemmed from different reasons. However, today we will look at the latest global list compiled by Richtopia periodical of the most charitable figures in the world with a focus on the top 2 Africans who made this year’s list. We begin with the top 5 on the general list with Warren Buffet who is the 3rd richest person in the world today with a net worth of $90.1 billion and number 1 on the list of most charitable people in the world. Following Buffet behind is technology Giant Microsoft’s founder, Bill Gates who is the 2nd richest person in the world today, and J.K Rowling of the legendary fictional bestseller book and fantasy movie of all time Harry Potter, at number 3. This list will not be complete without mentioning one of the most powerful and inspiring black women in the world, Oprah Winfrey who is the 4th on the list, while billionaire business magnate and investor Elon Musk of SpaceX, Tesla and PayPal is the 5th on the list. Coming down to the 6th on the list is where we delve into the most charitable Africans in the world with the number 1 African on the list being Nigerian Billionaire business magnate, Aliko Dangote of the giant manufacturing company Dangote Group, who recently endowed his foundation known as Aliko Dangote Foundation with a whopping $1.25 billion. The foundation was established in 1981 with a mission to enhance opportunities for social change through strategic investments that improve health and wellbeing, promote quality education, and broaden economic empowerment opportunities. It has now become the largest private foundation in sub-Saharan Africa, with the largest endowment by a single African donor. 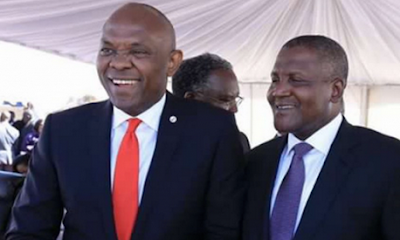 The second and last African to make the list at number 11 is Tony Elumelu of the widely known and popular Tony Elumelu Foundation, who is also the Chairman of United Bank for Africa. Simply put, Aliko Dangote at number 6 and Tony Elumelu at number 11 are the only Nigerians to make the list and the top 2 most charitable Africans of 2018.